"On behalf of the North Shore Central School District, I would like to thank you for the outstanding job you did in implementing a program providing our parents the option of purchasing all of their school supplies from one source in an easy and cost effective way. The program was well organized, ran smoothly and was a great success with both parents and teachers. Our parent groups have high praise for the program and report that they expect twice as many families to participate next year. Thanks again for all of your efforts in providing this wonderful resource for our parents and students. Our district looks forward to working with you again next year." 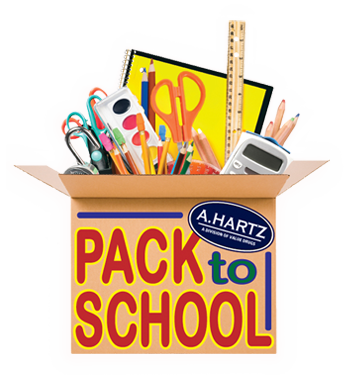 "On behalf of the Greenvale School, it was a pleasure working with the A. Hartz team for our school supplies. They were extremely accommodating and the quality of their products is outstanding. We look forward to another successful year. Many thanks!	" "Our school has been working with this program for 4 years and have had a wonderful experience. Yearly time frames are well thought out and managed well. Communication is timely and efficient. The customer service at A. Hartz is excellent. Everyone from the team at the office to those delivering the supplies is friendly and helpful. Delivery day is always seamless. We continue to be happy with the services offered and look forward to another great year working with A. Hartz." "Your continuous efforts in regards to late participants and new registrants to the school was tremendously appreciated. The flexibility of having the students participate with the school drive or go to your store directly was extremely accommodating." "The quality of the products included in the student packets was exactly what we expected and what we asked for. Our overall rating of the program is excellent. We were extremely pleased with the service and thought the process went quite smoothly."